Critical power switching device measurements, control loop modulation analysis, and line power harmonic testing are all simplified with a dedicated user interface and automatic measurements. Power Analyzer provides quick and easy setup of voltage and current inputs and makes measurements as simple as the push of a button. Tools are provided to help reduce sources of measurement errors, measurement parameters provide details of single cycle or average value over multiple cycles. Areas of power device turn-on and turnoff transitions, and conduction are all identified with color-coded waveform overlays. Measurement parameter table automatically calculates each element of device losses and sums their total. Modulation analysis capabilities provide insight to understand control loop response to critical events such as a power supply’s soft start performance or step response to line and load changes. Line power analysis tools provide insight to power consumption as well as enables quick precompliance testing to EN 61000-3-2. Decisions on power quality are aided with total harmonic distortion and analysis of contributions to distortion. The Power Analyzer Package is available on a wide range of oscilloscope models from 200 MHz to 65 GHz. 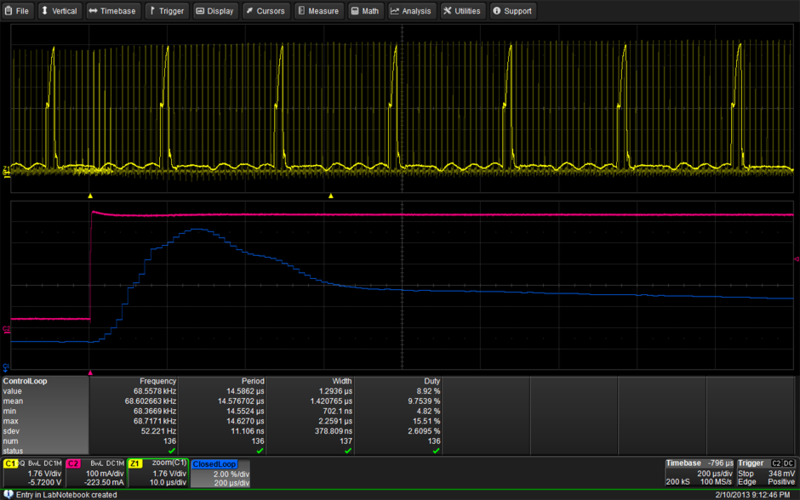 Analyze power device performance while the device is operating in circuit. 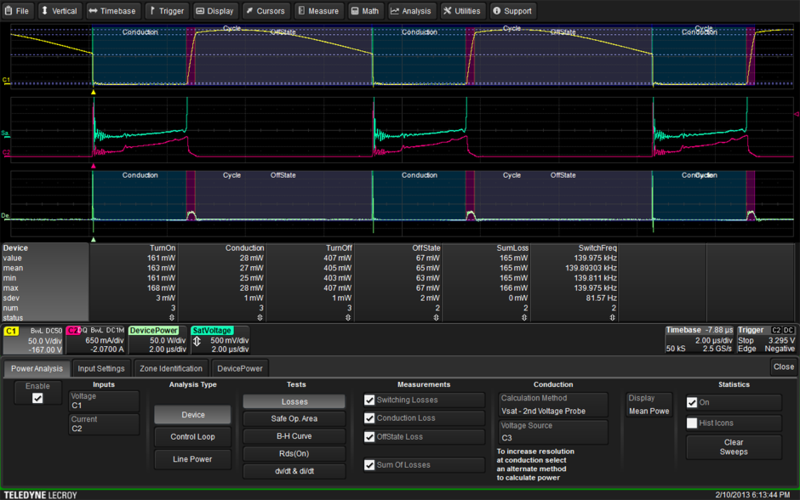 Easily make switching loss, dynamic-on resistance, dv/dt and di/dt measurements. 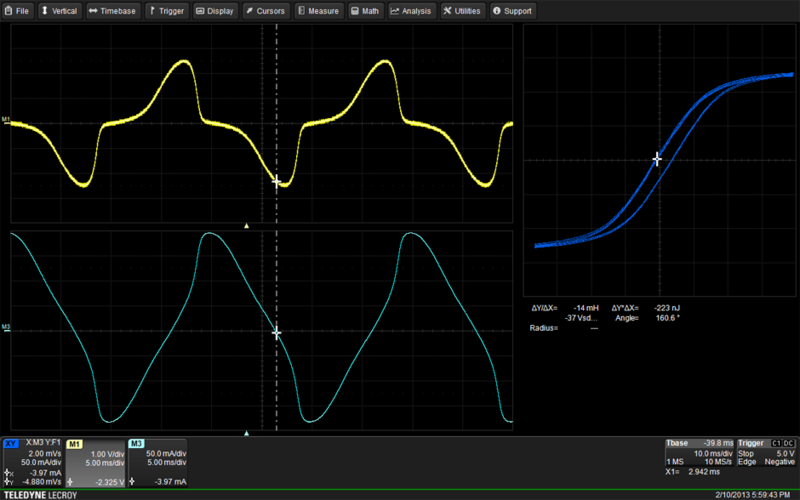 Quickly view safe operating area and B-H hysteresis curves. Turn-on, turn-off and conduction zones are identified with a colorcoded overlay, power losses in these zones are automatically measured and displayed. Losses associated with the switching, conduction, and off-state are measured independently and displayed along with the sum of selected loss types. Gain insight to circuit performance by seeing SOA plots to look for violations in the first cycles after an event or over long time periods. Finding SOA violations that occur for only a few cycles after an event, such as short circuit or startup, can be problematic. These violations often go undetected, and degrade the device over time. Using the long record length and fast processing of Power Analyzer, SOA display on very long records, confirm turn-off voltage and current limits are not exceeded. View the behavior of a magnetic device while it operates in circuit. Dynamic circuit changes show resulting magnetic saturation and operating region. View time domain display which graphically presents the modulated parameter in a time vs. parameter value graphical plot. A controller’s output pulse widths, duty cycles or frequencies, are individually plotted and time correlated with the controller’s output. 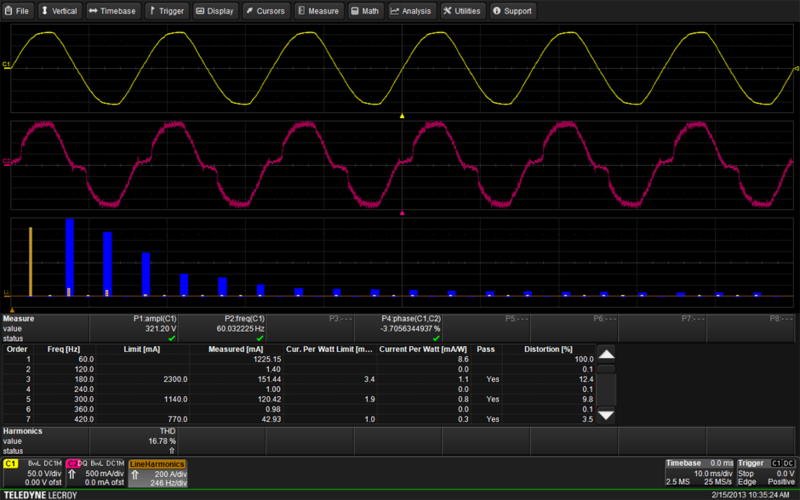 Integrated with the oscilloscope’s triggering capabilities, this analysis is a convenient tool for intuitively viewing the time domain, closed-loop response of the entire control loop, including any time constants added by the pulse width modulator.